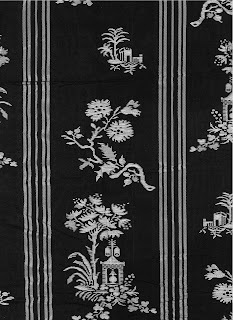 A woven fabric used in the London flat of Pauline de Rothschild. Private collection. Does anybody out there have any idea what company manufactured this pretty stuff, as the U set calls fabric or material? * And if it is still produced? 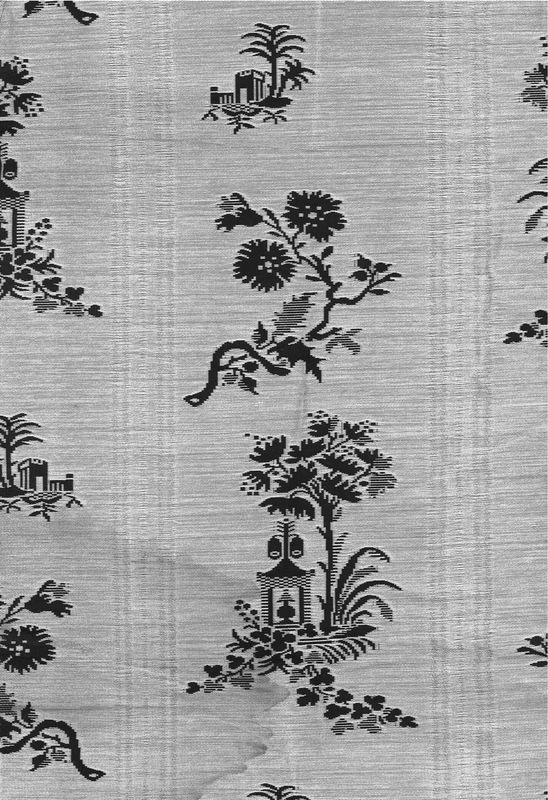 Woven with chinoiserie motifs such as lanterns and chrysanthemum-like blooms, it was used to drape the canopy bed in Pauline de Rothschild's London flat, in the early 1970s. She apparently brought the fabric to this much admired project, not her interior decorator John Fowler. Its original source remains, thus far, unknown. 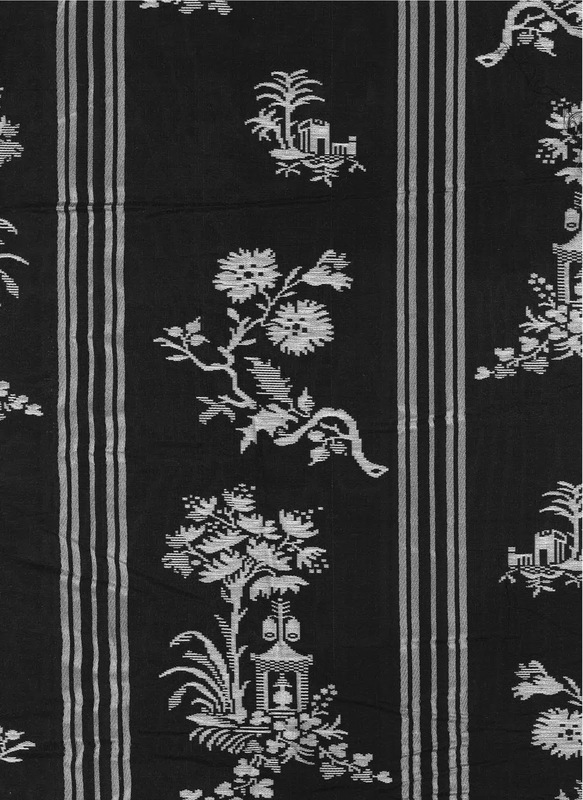 Per the baroness's idiosyncratic directive, the graphic black-and-silver fabric, which has a subtle moiré pattern worked into the background, was used on the reverse. She preferred that side's more subtle, silver-and-black colorway (see below). 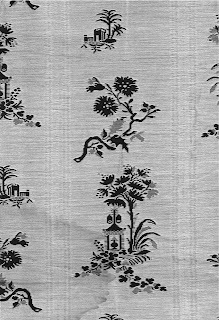 Rothschild preferred the paler reverse of the fabric. Private collection. * When Princess Margaret's husband, Lord Snowdon, born a commoner, told her how much he hated the material used for the dress she was wearing, the royal snapped, witheringly, "We call it 'stuff'." 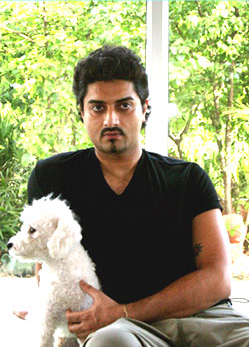 Jewelry designer Hanut Singh, at home in New Delhi, India. One’s heritage can often be one’s destiny. Soldiers beget soldiers, lawyers follow in parents' footsteps, and actors, artists, and writers often have similarly creative offspring. In the case of Hanut Singh, however, taking up the family trade was not an option. His paternal great-grandfather, Major General Sir Jagatjit Singh, Maharajah of Kapurthala—he lived in a circa-1900 replica of Versailles—lost his princely powers in 1947, along with his fellow subcontinental sovereigns, following the implementation of the Indian Independence Act. As a result the New Delhi-based Singh has no crown, but that doesn’t mean he can’t design one. Inspired by the Aluwalia dynasty’s famous collection of antique and modern jewels, which includes fascinating adornments commissioned from Cartier in the 1920s and ‘30s by one of Singh’s grandmothers, the ebullient entrepreneur spends his days creating gem-studded rings, bracelets, and other personal ornaments donned by women such as Padma Lakshmi and Beyoncé. Singh, who is 38, decided eight years ago that jewelry was his calling and walked away from a career as a well-known fashion writer and magazine editor. “I write quickly and I write well, but it never fueled my creative passions,” the alumnus of New York City's Hunter College explains. “It was just a job-job.” Recently, in a telephone interview from his home, Singh talked to me about his heritage, his designs, and why he considers "bling" to be a dirty word. Necklace with a ruby and diamond scimitar pendant. The prices for the jewels shown in this post are available upon request. To see more of Singh's designs, go to the designer's website, hanutsingh.com. Q: Among India’s princely families, the royal family of Kapurthala seems to have been especially passionate about jewels and commissioned hundreds of amazing pieces. One of your great-grandfather's wives, a Spanish dancer, owned an incredible Art Deco emerald necklace studded with diamonds once worn by one of her husband's elephants; it sold at Christie's London in 2007. And one of the that maharajah's turban clips made by Cartier had more than 3,000 diamonds and pearls. A: We have always had beautiful jewels—not just giant ceremonial pieces, but everyday things commissioned in the ‘20s and ‘30s by my father’s parents, Sita Devi and Karam of Kapurthala, who were big clients of Cartier and Van Cleef & Arpels. And my great-grandfather, the maharajah, was very fond of Boucheron and Cartier too. My mother and sister always talk about what they’re going to wear for the day or to a party. Jewelry has always been a very vibrant topic around the house. 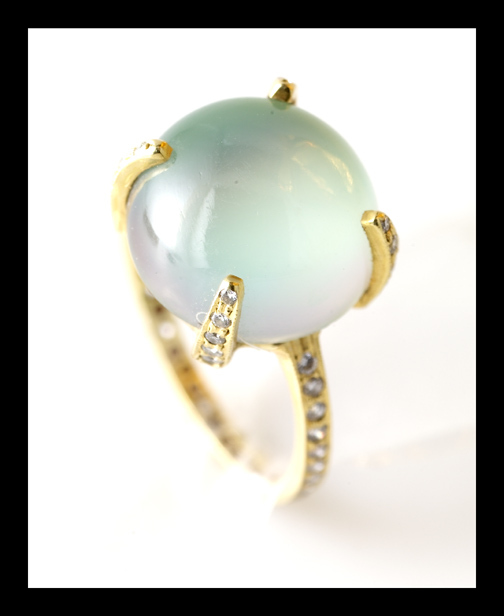 Cat's-eye ring with pavé diamonds. Q: Do you design jewels for family members? A: I have a very glamorous sister and mother and many cousins, so I make things for them too. My astrologer told me I needed to wear diamonds, so I designed some organic rings and a bracelet for myself. Maharajkumari Sita Devi of Kapurthala, Singh's maternal grandmother, in a silken gown and masses of diamonds, in the 1930s. Image courtesy of Hanut Singh. Q: Your grandmother Princess Karam of Kapurthala was an international sensation in the ‘20s and ‘30s—photographed by Cecil Beaton, dressed by Mainbocher, and bejeweled by Cartier and Van Cleef & Arpels. Dubbed a “secular goddess” by Vogue and one of the world’s best-dressed women by Look, she must have been an enormous influence on your career. A: My grandmother wouldn’t have dreamed of getting dressed without jewels, even if she merely planned to stay at home. She had incredible sugar-loaf diamond rings, lovely pearls, beautiful diamond bracelets, and amazing sapphires. 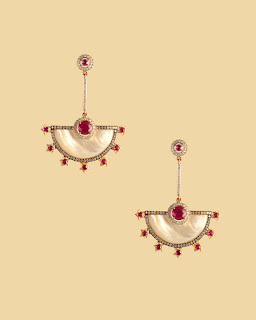 Cartier made her an Indian-modern suite and wonderful tutti-frutti brooches. It was a great visual education, to see works by the masters worn by the woman they had been designed for. Another portrait of Singh's paternal grandmother, Sita Devi (1915—2002), who was a daughter of the Raja of Kahipur. She married Maharajkumar Karimjit Singh of Kapurthala in 1928, when she was 13. The couple had two sons, one born in 1944, the other in 1947. Image courtesy of Hanut Singh. Q: What was your grandmother like? A: She was a total spark but also the most compassionate person I’ve met or encountered in my life. And hugely flattering. She would meet someone and right away would say, “Oh, young man, you are so handsome! You must be an actor!” Of course he probably wasn’t, but she cast that kind of spell. She was well read and traveled all over the world and could talk about history and literature, as well as more glamorous things. One of her best friends was Barbara Hutton, who became my father’s godmother. She took jewels very seriously too. Earrings of abalone and diamonds. Q: How did you get started in this field? A: I wasn’t trained in jewelry design at all. For some years I was an editor of a fashion magazine, running the offices, writing articles. But it never fueled my creative passions. So about eight years ago I borrowed money from my family and decided to create a collection of jewels, made from abalone and pearls. God was good to me, because it sold out entirely, and I was able to repay the loan. That first show opened up lots of avenues. 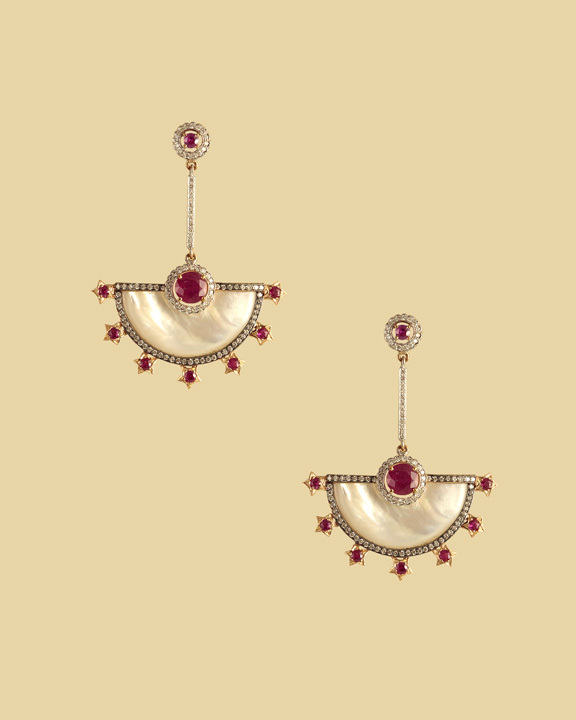 Earrings of mother of pearl, rubies, and diamonds. Q: Your family's collection of jewels has obviously been an inspiration in your work. A: Traditionally most of the jewelry was actually worn by men, meaning the big ceremonial pieces, like my great-grandfather's huge emerald-and-diamond turban ornament and massive ropes of pearls. 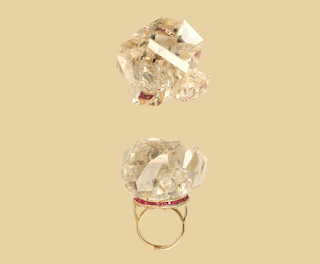 Last year I inherited a fantastic Golconda-diamond ring that is mentioned in a book about Cartier. In early 20th century, the maharajahs started going to Paris and ordering jewels for themselves and their wives. My grandfather Karam would take loose stones to his appointments at Cartier—emeralds, rubies, Kashmir sapphires, Golconda diamonds—and the designers would flip out. My grandmother told me that Monsieur Cartier was flabbergasted. 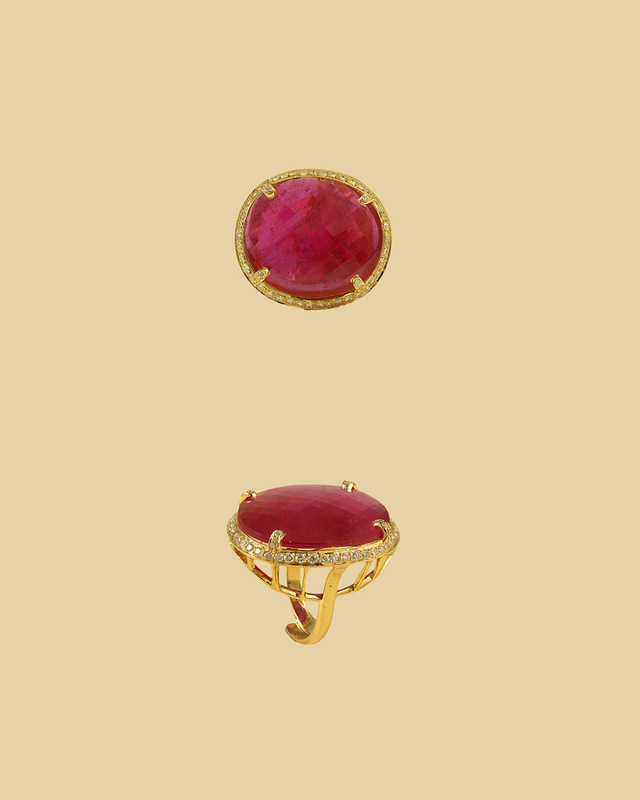 The patronage of the maharajahs was the reason French jewelry firms, especially Cartier, began producing Indian-inspired designs for the Western market, like the tutti-frutti pieces inspired by old Indian jewels that mixed a multitude of colored stones together. Ruby ring with pavé diamonds. Q: One of my favorite aspects of your designs is the colors, especially how you combine delicately shaded gems with darker, more rugged ones. What stones do you find inspiring right now? A: I’m super-excited by chalcedony, a milky blue semiprecious stone that was a favorite of the Duchess of Windsor; she had an incredible chalcedony necklace and matching earrings made for her in the ‘30s by Suzanne Belperron. I love the color and like combining it with black-diamond beads and mandarin sapphires, which are orange. Carved rubies, which is a Moghul technique of literally carving patterns into the surface of the stone, is another favorite of mine. I just finished a very simple hexagonal carved-ruby pendant, stark and architectural, that weighs 180 carats. Earrings of quartz, prehnite, and diamonds. 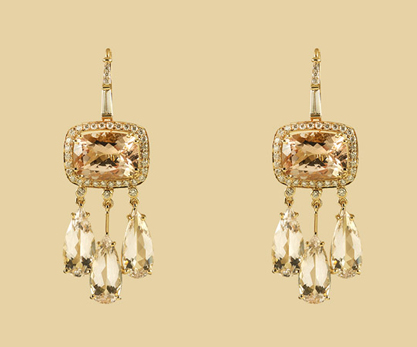 Principessa earrings of morganite and diamonds. Q: Several of your recent works incorporate morganite, which I’d never heard of and am now crazy about. A: I love morganite! 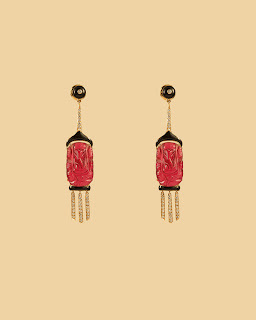 It is a stone that reminds me of colored diamonds from the 17th century, which often have a pinky-amber cast like cognac. A ring of rock crystal with rubies and diamonds, from Singh's latest collection. Q: In your new collection, however, color is confined largely to accents. A: My new collection is based around rock crystal. I found some beautiful old stones and have been turning them into sculptural rings and pendants decorated with rubies filed into rectangles. 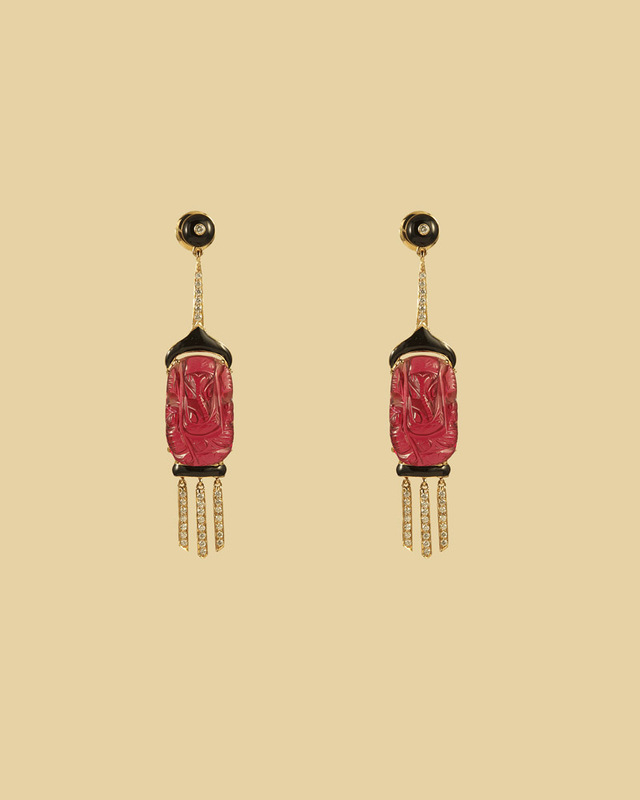 Rubies carved with images of the god Ganesh highlight a pair of earrings accented with diamonds and black enamel. Q: The style of the new collection is bold but not overwhelming. Even your bigger pieces tend have a delicate appearance. A: The jewelry world has gone so bling, which is a word I hate. Lots of people want jewels that are showy and flashy, with large stones, which isn’t my style at all. 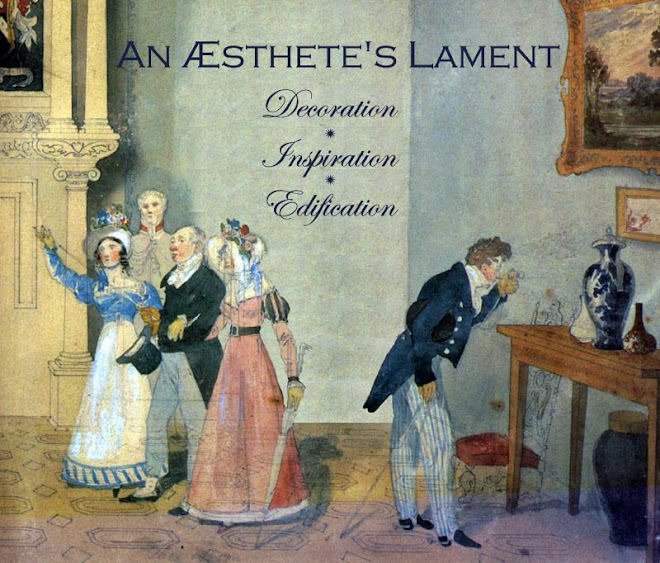 My work has always been delicate; I don’t know why. It’s just my aesthetic bent. Perhaps it's because I think delicate pieces are easier to wear, more versatile. I want to make things that are slightly Indian in feeling but that feel like today, or an amalgamation of what’s happening now with taste of the 1930s, the period when so many of my grandmother’s jewels were made. Goth-style earrings with carved black-onyx skulls, diamonds, pearls, and quartz. 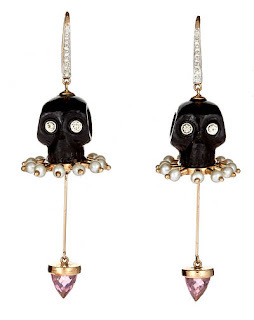 Q: There’s an edginess, though, in some of your works, like the onyx-and-diamond skull earrings. A: I can’t be super-crazy avant-garde, though, because nobody will buy the pieces. At the end of the day people don’t want to wear experimental things. Most of my pieces don’t scream. You have to look at them up close, and then the interest kick in. Which is nice, because I’m not good at selling myself. I’m sort of bashful and let the jewels do the talking. To see more of Hanut Singh's work and for contact information, go the designer's website, hanutsingh.com.